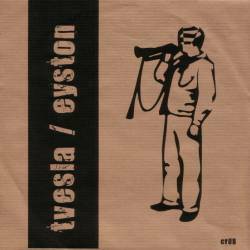 Tvesla / Eyston - Split-7"
After more than 500 reviews on this site, I finally write the first one for a vinyl record. This alone should show that vinyl has become a collector's item, with more and more young people not even owning a record player anymore. When it comes to split-7"es, the problem in my opinion is not only the inherently short running time of the two different sides, but also gives too little time to each band to present their music. In the case of the two bands involved here, I think it's sad because it's the first official release for both of them, and not only I would have liked to hear some more songs. Anyway, apart from the fact that I am not nostalgic about vinyl, it's a really cool going EP. The first side features the song Roboter by Tvesla, a relatively young instrumental post guitar noise math rock band, well, you get the picture. It's three guys playing angular rock music with a lot of breaks. Their songs are generally not too wild, leaving always some room for melodies. Somehow I always feel reminded of Eastern European post punk music. Apart from the fact that there only guitar, bass and drums, it's especially the latter which has an unusual sound, as the snare sounds more hollow than on most rock records. Apparently Roboter is Tvesla's shortest song ever, their other tracks wouldn't have fitted on a single side of a vinyl seven inch. Interesting music! Eyston have been around already for years, but they split up and only recently got back together. Although I have seen them a couple of times in the far past, I can't really recall what they did then, but it surely has to be different from their new direction. Eyston play ultra-complicated math core, really very hard to follow, with again only three members, but all of them sharing the vocals, which are only a way to add something lyrical to the music, as they are most frequently shouts. Anyway it's the music that counts with Eyston, and from a technical point of view you won't find many (if any) better bands in Luxembourg. The bass is playing a wobbling weird rhythm, while the drums are thrashing free-form pattern that always seem to meld into the general rhythmic structure, while the guitar is totally sick, as if Joe Satriani had suddenly received balls, meaning there's a lot of solo work melding into complicated rhythms, and don't even ask me to detect all the time signature changes. Eyston may not be music for the masses, but those who are fond of occasional technical treats just need to see one of the band's gigs to become utterly convinced. This split-7" has been released of course only as a limited edition, and if you still like to listen to vinyl from time to time, and you want to discover two of Luxembourg's hottest bands, there will be no way around this little gem!